Seville is Spain at its best -- orange trees and mantillas, flower-filled patios and colorful locals. Famed for its Easter festivities, Seville follows those events with its April Fair, a week of celebration with food, wine, bullfights, flamenco dancing and the region's own special dance, the sevillanas. 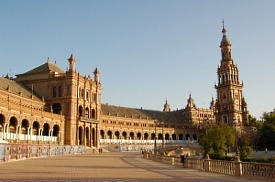 Seville houses some of the most important artistic works and architectural monuments in Spain, such as the 12-sided Tower of Gold, the Alcazar and the Museo de Bellas Artes.